How many Retailers are using Enterprise Level Analytics? About 90% of the retailers are using Enterprise Level Analytics solution, which can be Adobe SiteCatalyst, IBM Coremetrics, Google Analytics Premium, WebTrends etc. Rest of them are opting free solution like Google Analytics Free version. Which is the most used Enterprise level Web analytics tool? Not so surprisingly, Adobe SiteCatalyst topped the category with more than 50% of the retailers using it as their primary tool, followed by IBM Coremetrics and Google Analytics. 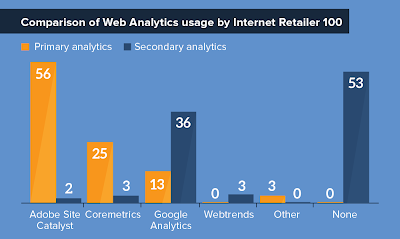 Surprisingly no retailer is using WebTrends as their primary analytics tool. WebTrends, at a point of time was industry's most sought after tool. It's sad to see its fall now and you can see Adobe growing as a giant day by day in Online marketing. What is the average number of Marketing Tags deployed on to the websites by the retailers? Why is this question important to understand? If you are one among the top 100 retailers, you would be doing a lot of things apart from simple analytics for your website. You might also be having a feedback/survey tool like Opinion Lab or an advertising tool like Doubleclick or any kind of other marketing tool. So, what is the average number of marketing tags a retailer from top 100 will be having? Its around 10 tags. Shutterfly topped the category with 39 different tags on the website. There were a total of 986 different marketing tags that has been found on the 100 retailer sites. Also the following picture gives us the distribution of number of retailers with total number of tags on their site. How many of them has a Tag Management System installed? About 45% of the top 100 retailers are using a Tag Management system. Here is a snapshot of the market's leading TMS tools that are being used by these retailers. 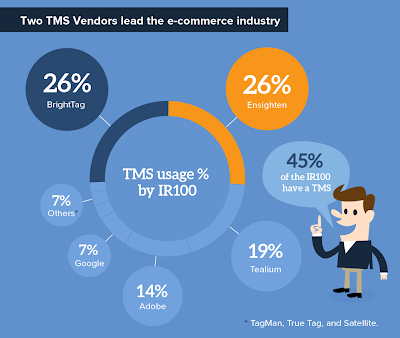 Ensighten and BrightTag tops the list with each of 26% share followed by Tealium with 19% and Adobe's Dynamic Tag Management at 14% and Google's free TMS tool Google Tag Manager at 7%. What are the major pain points which are in the industry? ♦ Incomplete implementations. It is found that 93 out of 100 retailers have incomplete implementations, meaning they are not leveraging the potential of a TMS tool. ♦ More number of tags on the page affects the page load of the time a lot. 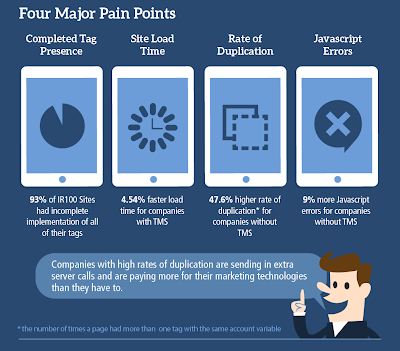 Websites with a TMS installed are 4.54% faster than the websites without a TMS. ♦ It is quite possible to have the same tag multiple times on the same page causing duplication. This is a very bad practice. 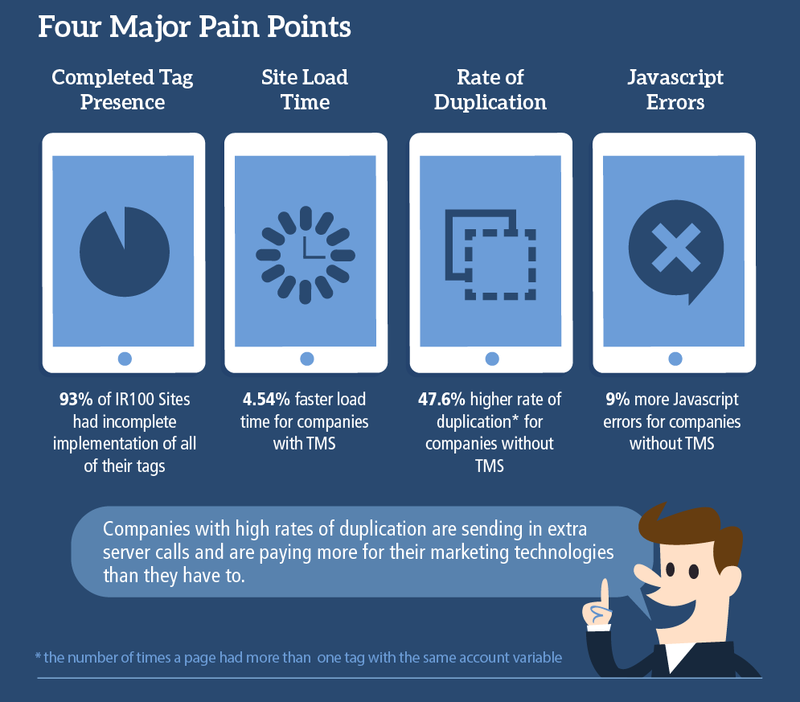 And it is observed that there is a staggering 47.6% higher rate of duplication for companies without a TMS. To conclude, it shows that still the retail market is in beginning stages about understanding the importance of TMS. It is the responsibility of the Marketing team and the CMO of the companies to grab such opportunities and implement the latest technology which can result in a better ROI, better user experience and a better management of the marketing activities. So, what is the maturity levels of the clients you have worked with on Tag Management Solutions? Leave your experiences as comments below. Courtesy: All the infographics has been taken from the Lima Consulting group's infographic on this topic under the creative common license.